Who's in desperate need for a vacation? Because I know I am! I want to go to an all-inclusive resort and lay on the beach and watch the sunset. But instead.. I'm at work sitting behind a computer. I can only daydream.. I started by painting my nails with one coat of Beyond the Nail - Bright White. While it was drying, I went around each nail with NailExperiments - Easy Peel Latex Barrier. When everything was completely dry, I got a sponge and painted on Beyond the Nail's - Cosmopolitan, Spring Orange Creme, & Spring Yellow Creme. I sponged this over each nail about 3 times to get the opacity I was looking for. When I was happy with the outcome, I peeled away the Latex Barrier, and got a small brush to clean up any excess nail polish on my skin. 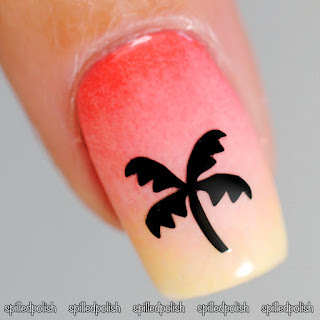 I placed a Palm Tree Nail Decal on each nail and then topped it off with one coat of PRO-FX - Quick Dry Topcoat.